Hae Dong Jho, M.D.& Ph.D. 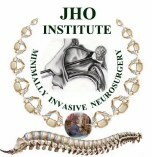 Although various minimally invasive surgical techniques can be used, Dr. Jho utilizes mainly two types of minimally invasive surgical techniques in most craniopharyngiomas (depending on the location of the tumor). The first is an orbitofrontal craniotomy via a small eyebrow incision, and the second is an endoscopic endonasal approach via a nostril without a skin incision. Orbitofrontal craniotomy involves a small skin incision at the eyebrow. The roof of the orbit will be lifted and surgical access will be made toward tumor through the orbital cavity instead of the brain cavity. This transorbital surgical trajectory will minimize the chance of brain damage because the brain is not retracted with metallic retractors as is during conventional brain surgery. Endoscopic endonasal surgery is performed via a nostril without a skin incision. Through the nasal cavity, the base of tumor is approached for removal. When tumor is extended predominantly into the third ventricle, an endoscopic transventricular approach can be also used. Figure 1. Preoperative MR scans, axial (A) and sagittal views (B), display a large craniopharyngioma in the third ventricle. A patient following an orbitofrontal craniotomy via an eyebrow incision wears a small bandage at the right eyebrow area (C). Postoperative MR scans, axial (D) and sagittal (E) views, confirm complete tumor removal. Intraoperative endoscopic view reveals optic nerve system and anterior cerebral arteries in another patient after endoscopic craniopharyngioma removal (F). 2. Dr. Jho's endoscopic endonasal removal of craniopharyngiomas through a nostril without a skin incision. Figure 1. A schematic drawing (A) demonstrates how craniopharyngiomas are removed through a nostril. An endoscope is inserted in front of the tumor through a nostril and surgical instruments are inserted next to the endoscope through the same nostril for tumor removal. A preoperative MR scan, coronal view (B), reveals a recurrent craniopharyngioma that had recurred after previous tumor removal through a conventional frontotemporal craniotomy by another neurosurgeon (the tumor is white in color). The tumor was completely excised via a nostril using Dr. Jho's endoscopic technique. A postoperative MR scan, a coronal view (C), reveals complete tumor removal. The tumor site is reconstructed with an abdominal fat graft (white). Craniopharyngiomas are benign brain tumors, which arise at the juncture between the brain, hypothalamus, and the pituitary gland (the center of the hormonal control of the entire body). It can be solid, cystic, or both. In the vicinity of this area is part of the optic system, consisting of the optic nerves (visual nerves coming from the eye), the optic chiasm (crossing part of the visual nerves above the pituitary gland), and the optic tracts (visual nerve cables heading to the brain). Also in the vicinity are the hypothalamus (which is a core portion of the brain that controls the vital functions of the body), the third ventricle (which conveys cerebrospinal fluid), and the pituitary gland. Craniopharyngiomas produce symptoms by compression of the surrounding anatomy. Tumor compression at the pituitary gland or stalk produces endocrine disorders. Compression at the visual nerve system causes visual disorders, and compression at the hypothalamus can cause obesity, loss of body mass, or complex disorder of vital functions. The blockage of fluid passage at the third ventricle by tumor compression can produce hydrocephalus, which is accumulation of the cerebrospinal fluid (CSF) in the ventricles. Treatments includes observation, radiosurgery or radiation therapy, stereotactic aspiration of the cystic content, and/or surgical removal. The choice of treatments depends on the symptoms, the location, and the nature of the tumor.